Love food - hate waste? Here's Harvest Share! If you can't stand to see food wasted, and think the idea of supermarkets throwing away tonnes of perfectly edible fruit (but not perfect sizes or shapes) is a bit crazy, you will love the Harvest Share project. 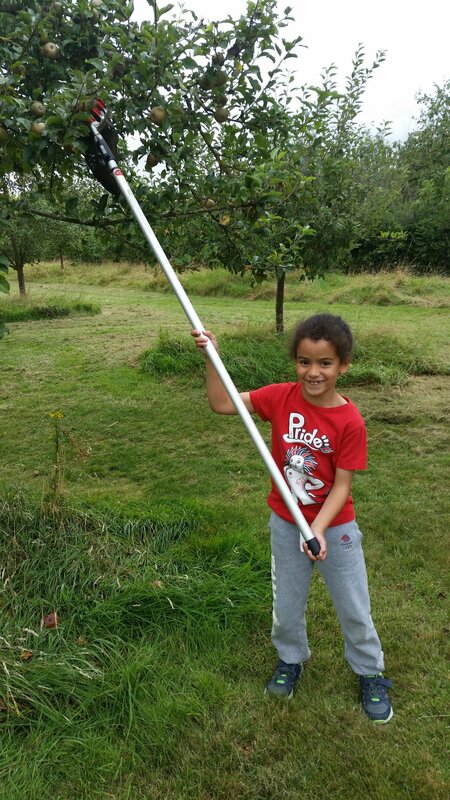 In just three hours work we save over 120 kilos of apples from going to waste. Volunteers welcome at Anne Hathaway's Cottage from 10am-noon every Saturday until mid October. Register your interest here. Harvest Share is as a result of the hard work done by Roger Matthews and Barbara Cooper at Transition Stratford and brings together an enthusiastic team of volunteers to pick, sort and distribute fruit from orchards and gardens in Stratford upon Avon. Thanks to Jon, Stephen, Ann Louise, David, Maureen, Annette, Ursula and Robin for the help in sending out the 120 kilos to well deserving local groups. Over the last two days we have picked fruit at Anne Hathaways Cottage and a private garden at near to Ettington. Jack Lloyd and the team at the Forest of Hearts are delighted to be able to co-ordinate this enjoyable and useful activity that means that good food gets used and enjoyed by the local community. A sustainable project that does good and makes people feel good!